Obviously Carlos Beltran isn't going anywhere, even though this bunting crap is frustrating to see. For some reason the guy comes up in RBI situations and decides to bunt for an infield hit. Ridiculous. This season seems to be Cliff Floyd's last in New York, as Lastings Milledge has been all but annointed our 2007 leftfielder. 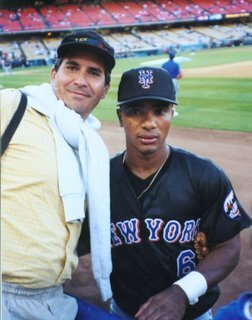 As for right field, if the Nady/Diaz combo doesn't pan out, the Mets should make a run at bringing back Melvin Mora, who may be a free agent at the end of the season. He's been playing 3rd base for the Orioles, but he was dynamite to watch in the outfield when he played for the Mets. 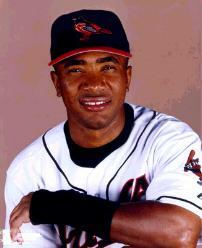 Of course the best part about watching Melvin Mora play is that he often looks like he's about to cry. Returned from a quick jaunt to Las Vegas to find out that Pedro is a no-go for Opening Day, so it looks like I'll be watching Glavine pitch on April 3rd. The only question now is if he'll pitch the second or third game of the season. selfishly, I'm kinda hoping they save him for the friday game against Florida, which should put him on track to pitch the April 12th game in D.C., which I'll be attending. Anyone have any insight as how the rotation is supposed to shake out, with the off-days? "I will not trade Jose Vidro; I will not trade you; you will play left field or you will be placed on the disqualified list. If you force us to make that move, you will lose out on your $10 million salary and you will lose out on the thing you have been waiting for: free agency. If you think your value is reduced by moving to the outfield, you should consider what your value will be after spending most or all of the upcoming season not playing. You should consider that people will perceive, rightly or wrongly, that you are a selfish player. And you likely will get booed everywhere you play for the rest of your career. "This is going to play out in one of two ways, both of which you control. You will either come to your senses and take a long-term perspective and see this as an opportunity, or you will cripple your career and force our hand." "Listen, A-Rod. This is going to play out one of two ways: You will either take our lowball offer and see this as an opportunity to play for what is right now New York's second team, and all the pressure to improve the franchise will ride on your shoulders, or you can take Texas' offer, which is double what ours is, and you will be viewed as a greedy player and get booed everywhere you play for the rest of your career, because I'm going to leak to the press that we were willing to pay you whatever you wanted until you said you wanted a tent in the Shea parking lot." Today is a day I'm glad I'm not still living in New York, where I'd find myself listening to the so-called experts on WFAN. From what I understand, the airwaves are all a-flutter with rumors of the Mets trading Victor Diaz for Alfonso Soriano. Look, on paper it's a no-brainer. Soriano is a proven hitter, and Diaz isn't even a proven major leaguer, but the truth of the matter is that a defensively-challenged second baseman who also happens to be a very selfish player is the last thing this club needs right now. A deal might have made a little sense before Omar acquired Carlos Delgado, but with Delgado now able to provide the offensive 'oomph' the club had been lacking, Soriano's bat is less necessary. At the same time, Delgado's lack of range makes the defense we get at second much more important than the offense. Now, if Soriano were willing to play Right Field for the Mets, that might be a different story. But that's a moot point, of course. Any objective observer can see that a deal for the Soriano makes no sense for the Mets, but New York is all about star power, so the media just can't help themselves. But giving it serious air time puts a serious knock on their credibility. If anyone is within earshot of this drivel, and would like to enlighten me as to which knucklehead is saying what stupid thing, please post a comment. Opening Day is two weeks away. My wife and I will head up North next Friday, see some old friends, get some great pizza and bagels, and meet up Monday morning to head over to Shea for Opening Day 2006! We'll have to make sure to get there on time, as the Mets have planned a pretty cool treat for the ceremonial first pitch. Jesse Orosco is going to throw to Gary Carter, commemorating the 1986 World Championship winning battery. Expect a loooong standing ovation, especially if Gary makes good on his promise to jump into Jesse's arms, a la '86. I'm thinking Nady and Hernandez have won their battles for their respective positions at this point. Nady and Victor Diaz have put up similar stats this Spring, with Nady faring slightly better, but Nady's experience will probably land him the Opening Day job. Keppinger has outslugged Hernandez thus far this Spring, but the statements made by Willy lead most reporters to assume Keppinger won't be given the job out the gate. As for the pitcher, Pedro Martinez doesn't seem to think pitching Game One is that big of a deal, and Glavine's schedule is geared towards pitching that day. Lord Forbid the Mets mess with Glavine's precious schedule again, so I expect to see Glavine on the hill that day, with plenty of quotes about his goal to reach 300 wins in the papers that day. From a financial standpoint for the Mets, it's actually better for Pedro to start the second or third game. Opening Day is sold out anyway, with or without Martinez, but they might sell more tickets one of the later games with Martinez pitching than they would otherwise. I'll just have to accept that I won't see him pitch that day, and will be resigned to coming home and watching him pitch on TV. If I am willing to fork over the cash, that is. I have DirecTV, which hasn't announced plans to carry SNY yet, but I'm outside the local region so I'll have to subscribe to Extra Innings to get the game. If I sign up by April 2nd, it's $160 for the season. Man, that's expensive. It stinks to have to pay for 60 games a week when I only want 7. I might go with MLBTV again. It's half the price, at $80 for the season, or $15 a month, and I can watch the games from my laptop when I travel as well. I'll also surely get the Gameday Audio package from MLB.com, which is the best bargain of all. For $15 I get every team's radio broadcast, for the whole season. The thing is, I've always loved listening to baseball in the car, and an internet subscription won't help me with that. So I'm also still thinking about getting XM Radio, which for $13 a month gets me every game, plus all the music channels as well. I am very indecisive about this. I feel torn about spending so much for the Extra Innings package, when living in North Carolina allows me to see at least 33 games anyway (whenever the Mets play the Braves or the Washington Nationals). What should I do? Speaking of the Nationals, I will be traveling to D.C. on April 12th to see The Mets play a road game there. Maybe I'll get lucky and see Martinez pitch that game? Al Leiter retired today. He really should have retired a couple years ago, when he became a five-inning pitcher. Now he's a only valuable as a lefty specialist, and he doesn't want that gig. Al's a nice guy and he kind of left on bad terms, but I hope in retrospect he realizes Omar was 100% right in pulling his offer off the table and chasing Pedro Martinez instead. I always thought Al was a bit of a baby there. Omar made him an offer, and Leiter said no. Sometime later, probably after he saw it was better than anything ese he could get, Al came back and wanted the deal. Well Omar had already decided to go after Pedro, and told him the contract offer wasn't on the table anymore. Leiter whined to the press, who had always given him a fair shake. Leiter played for both the Marlins and The Evil Empire last season, and stunk pretty bad for both clubs, so he should be able to see that the Mets knew what they were doing by moving on. It would be nice if he came back to the Mets now as a coach or as a broadcaster, as he's shown he's very capable there in his work with ESPN. Maybe he can also make up with Chris Russo. Leiter was a bit of a baby with that whole thing too. The other prediction writers have made is that he has a future in politics. I am not sure I would support Al The Candidate, but I do appreciate the way he pitched for The Mets in his time with the club. I've even forgiven him for that time he told The New York Times he was having trouble "staying motivated" while pitching in 2004. Anyway, all the best to you, Al... good luck!